Over the weekend, I participated in my third and final Dance Marathon at Northwestern. Dance Marathon is a year-long fundraising effort that culminates in a 30-hour, non-stop dance party with over 1,000 dancers. We raised over $1.2 million dollars this year, with over $700,000 going to the primary beneficiary, The Danny Did Foundation. Why am I mentioning this? Well, I was on the food committee (obviously), and at the end of the event, we are allowed to take home whatever random assortment of food is left over. The rest gets donated to charity. What did I bring home? A pineapple! And the red pepper, too! So in the end, Dance Marathon, one of my favorite things about Northwestern, was the inspiration for this recipe. And the song? They play it after revealing the final total at the end of the event, bringing everyone to tears. The best, most fulfilling tears anyone can cry. For more information about Dance Marathon, check out this HuffPo article and the official website. In a small bowl, dredge the chicken in corn starch so that it is coated on all sides. In another small bowl, combine the 5 ingredients for the sauce and set aside. Boil water in a medium pot for the lo mein noodles. Cook the noodles according to package directions. 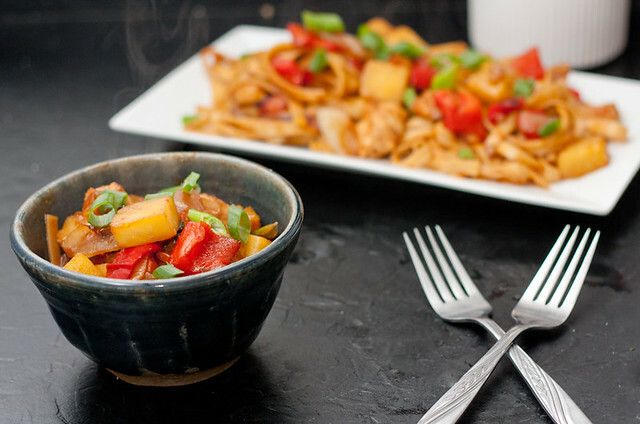 The brand I use only takes 5 minutes to cook, so I started them right before adding the pineapple to the stir fry. In a wok or large pot over high heat, heat the canola oil. Add the chicken and brown on all sides. Remove the chicken and set aside. Add the onion, carrots, celery, and bell pepper to the large pot over high heat. Cook, stirring a few times, until onions and peppers are browned and beginning to soften. 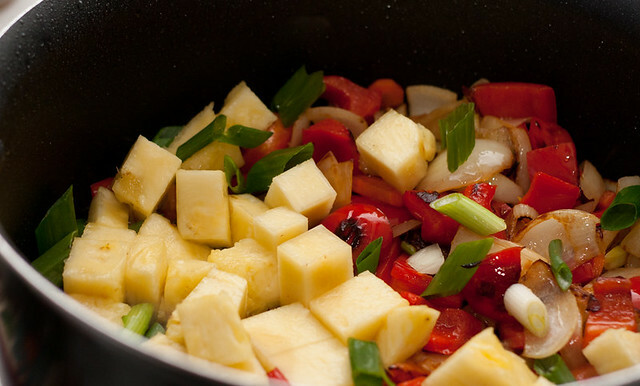 Add the pineapple and green onion and cook until everything is browned and tender. Add the chicken, noodles, and sauce and stir well to coat everything. Cook until the chicken is heated through and the sauce is thickened. Top with extra green onions and enjoy! You’re the one that taught me how to stir fry! And you have the awesome wok. Dad shouldn’t be eating noodles; he should have brown rice. Looks YUMMY! 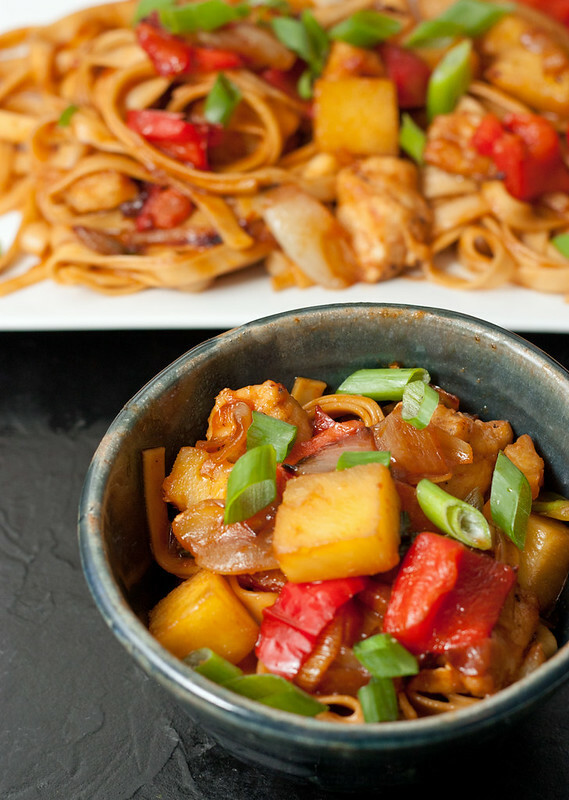 I love pineapple in my stir-fry … definitely going to need to give this recipe a try. Made this last night, absolutely delish, and the leftovers (minus the noodles) were great in a wrap with cabbage slaw! This looks and sounds really good. I’m going to try using coconut oil. Oh em gee. I made this last night and it is UNREAL. So so so good! 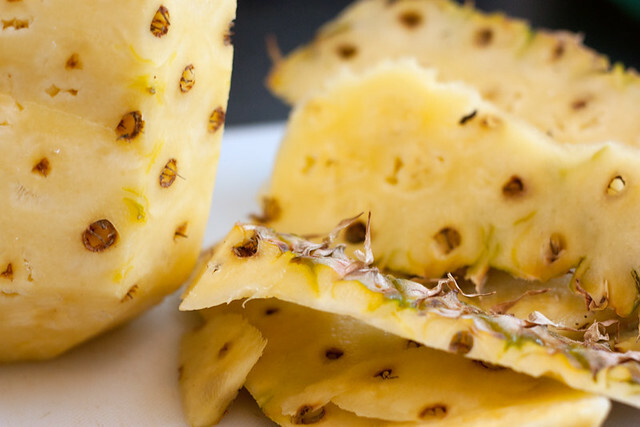 If you’re wondering if you should make this tonight, YOU SHOULD. I can’t wait until lunch for leftovers! !